Up-to-date and comprehensive, *including the ACA 2014 Code of Ethics, * this practical best-selling text provides students with the basis for discovering their own guidelines for helping within the broad limits of professional codes of ethics and divergent theoretical positions. Respected authors Gerald Corey, Marianne Corey, Cindy Corey, and Patrick Callanan raise what they consider to be central issues, present a range of diverse views on the issues, discuss their position, and provide opportunities for students to refine their thinking and actively develop their own position. 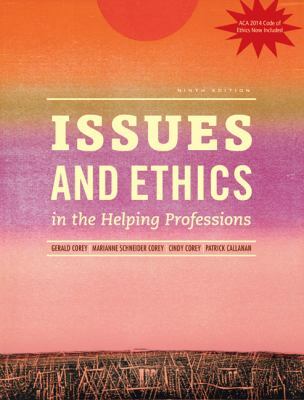 ISSUES AND ETHICS IN THE HELPING PROFESSIONS, 9th Edition, explores such questions as: What role do the therapist's personal values play in the counseling relationship? What ethical responsibilities and rights do clients and therapists have? What considerations are involved in adapting counseling practice to diverse client populations? With new material in every chapter and an emphasis on critical thinking, the ninth edition is useful for students as well as practicing professionals. Used Good (1 available) 130538945X No CD Included. Access code may be previously used. Moderate dirt wear, wrinkling or creasing on cover or spine. Good binding. Moderate writing and highlighting. Cover has used book stickers or residue. Marker on cover or bottom edge of book. BORGASORUS BOOKS, INC.
Used Good (1 available) 130538945X No CD Included. Access code may be previously used. Light dirt, wear, fading or curling of cover or spine. Good Binding. Minimal, if any highlighting or writing. Cover has used book stickers or residue. BORGASORUS BOOKS, INC.